Hayes’ Addison Harvey, middle, lofts a shot over Hilliard Bradley’s AJ Mirgon, left, and Chris Mayfield during the first half of Friday’s OCC showdown in Delaware. 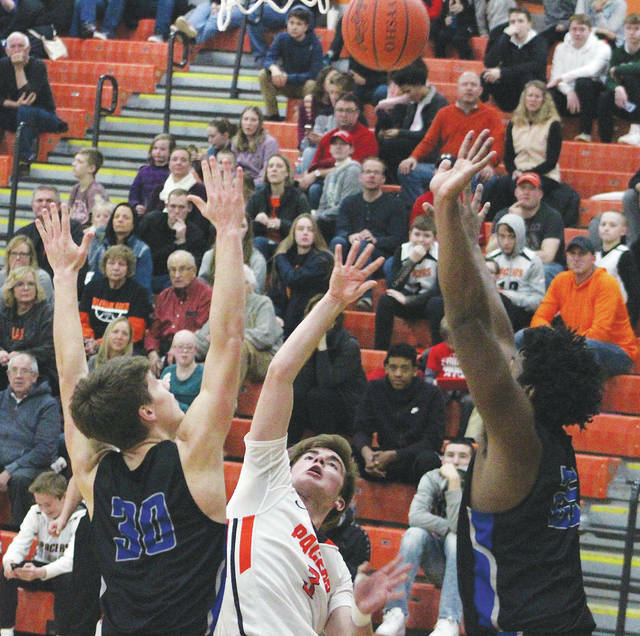 DELAWARE – AJ Mirgon and Matt Allocco accounted for 20 points of a 22-3 Hilliard Bradley start and the Delaware Hayes boys basketball team couldn’t recover. The Pacers whittled the deficit down to six, but couldn’t get any closer and fell 59-46 to the Jaguars in OCC-Cardinal play Friday night. Bradley upped its winning streak in league play to 40 games and its regular-season streak to 30 with the win. Bradley can clinch the league championship outright with a win over Jerome Tuesday night. Mirgon finished with 18 points and four rebounds and Allocco went for 16 points, five boards and five assists to lead the Jaguars (16-0, 11-0). Mirgon opened the game with a 3-pointer on Bradley’s first possession and after a Paul Burris 3, Mirgon knocked down his second and followed with a put-back to push the lead to 8-3. Allocco took over from there, scoring 10 of the team’s next 14 points to push the lead to 22-3. Burris hit his second 3 with 30 seconds left in the quarter to end the run. Terin Kinsway knocked down 3s on consecutive possessions to cut the Pacer deficit to 22-13 and Jack Weller scored underneath off an Addison Harvey feed to pull Hayes within 24-16 at the break. Bradley pushed the lead back up to 12 early in the third quarter. But Harvey assisted on a Burris 3 and a Nate Griggs bucket and followed with a basket of his own on consecutive possessions to cut Hayes’ deficit to 36-30 with 1:05 left in the third quarter. Winston Stone and Zach Hummel each knocked down 3-pointers in the final minute to push the Jaguar lead back to 10 at the end of three. Burris knocked down his fourth triple of the game early in the fourth to cut it back to seven, but Bradley put it away with a Keaton Norris 3 and a Mirgon basket underneath on back-to-back possessions. Burris had 18 points, Kinsway added nine points and seven boards, Griggs had nine points and four rebounds and Harvey chipped in eight points and five assists to lead the Pacers (12-5, 7-4). Hayes was without senior Jwan Lyles (bruised hip) for the second straight game. Hayes is back at it Tuesday night, traveling to Worthington Kilbourne in league play. Tip-off is scheduled for 7:30 p.m.